In a Woman’s Shadow: A Visual Essay—Photos by Nadine Epstein April 16-May 14, Reception and Talk: April 17: 5-7 p.m. 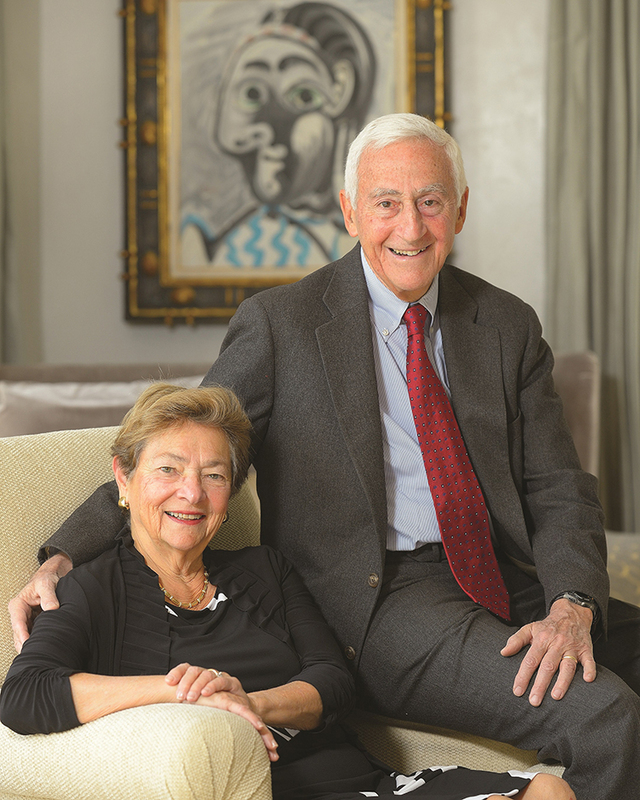 In support of the Power of Penn Arts & Sciences Campaign, Roy Vagelos (C’50, PAR’90, HON’99) and Diana T. Vagelos (PAR’90) have made a gift of $50 million to Penn Arts & Sciences for a new science center to house researchers focused on energy science. The gift is the largest in the School’s history. The new building will be named in honor of Roy and Diana Vagelos and located at 32nd and Walnut Streets. It will provide state-of-the-art research space that connects physical scientists and engineers. The new Penn Arts & Sciences and Penn Engineering facility will house the Vagelos Institute for Energy Science and Technology, which brings together researchers from both Schools to solve scientific and technological problems related to energy. It will also be a home for the Vagelos Integrated Program in Energy Research (VIPER), an undergraduate dual degree program run jointly by Arts & Sciences and Engineering. The new building represents Penn’s commitment to energy research and capitalizes on growing momentum across the University. It will be an incubator for scientists and engineers to engage in cross-disciplinary work and train postdoctoral fellows, graduate students and undergraduates as future leaders in the field. Dr. Vagelos, a chemistry major who graduated from Penn in 1950 before going on to receive a medical degree from Columbia University, is the retired chairman and chief executive officer of Merck & Co. He currently serves as chairman of the board at Regeneron Pharmaceuticals. Dr. Vagelos served as Chair of the University’s Board of Trustees from 1995 to 1999, and he is a former member of the Penn Arts & Sciences’ Board of Overseers and the founding Chair of the Committee for Undergraduate Financial Aid. Mrs. Vagelos is a former overseer of the University of Pennsylvania Museum of Archaeology and Anthropology. The Vageloses’ longtime support of Penn Arts & Sciences includes the Vagelos Institute for Energy Science and Technology, the Vagelos Professorships in Energy Research, VIPER and several other science-related programs, undergraduate scholarships and endowed professorships. 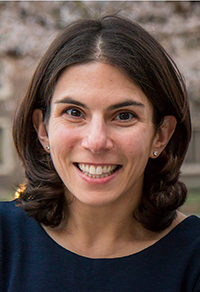 Megan S. Ryerson, associate professor of city and regional planning and electrical and systems engineering, and associate dean for research at the Weitzman School of Design, has been appointed the endowed UPS Chair of Transportation. This named professorship recognizes an outstanding scholar-teacher in transportation for a term of five academic years. Dr. Ryerson’s research in transportation planning focuses on aviation systems, critical infrastructure, and pedestrian and bike safety. Her work has been published in the leading transportation and planning journals and received support from the US Department of Transportation and the Federal Aviation Administration. The recipients of the annual Penn Engineering teaching and advising awards are selected directly by Penn Engineering students after thoughtful consideration. Igor Bargatin, the Class of 1965 Term Assistant Professor in Mechanical Engineering and Applied Mechanics, has been awarded the S. Reid Warren, Jr., Award, which is presented annually by the undergraduate student body and the Engineering Alumni Society in recognition of outstanding service in stimulating and guiding the intellectual and professional development of undergraduate students. Dr. Bargatin received a BS in theoretical physics at MV Lomonosov Moscow State University in 2000. He subsequently earned a PhD in physics and electrical engineering from the California Institute of Technology in 2008.
helping students realize their educational, career and personal goals. The Online Learning Initiative is announcing a call for Innovation MOOC proposals. Since 2012, the Online Learning Initiative (OLI) has supported the development of online learning across Penn. Provost-funded online projects receive financial, design and production support for creating online learning experiences, such as MOOCs, course series and microcredentials. Faculty members are invited to submit proposals for development of the newly launched Innovation MOOC. What is an Innovation MOOC? OLI provides assistance throughout the proposal process, including online course design support. Innovation MOOCs are fully funded by the Office of the Provost and do not require school cost-sharing for faculty and teaching assistant stipends. OLI will support the production of two Innovation MOOCs each year. Please contact OLI at onlinelearning@upenn.edu to schedule a brief consultation to review the proposal form. Proposals are due no later than June 1, 2019. Only proposals that use OLI’s form can be considered. The Online Learning Initiative operations team will be hosting consultation hours on Tuesday, April 23 from 1-5 p.m. and Wednesday, May 22 from 1-5 p.m. in Room 134, Van Pelt-Dietrich Library to provide more information about online opportunities across Penn and answer any proposal questions. The OLI team is always available to meet with faculty members and school online teams to discuss ideas, proposals and future projects. Please email onlinelearning@upenn.edu if you would like more information or to schedule an individual consultation with the OLI team. A new interdisciplinary collaboration between Penn’s School of Social Policy & Practice (SP2) and the Wharton School will soon provide current SP2 students and alumni a flexible opportunity to chart their own learning path, become effective leaders and generate enduring social impact. On May 1, the Schools will launch a new online professional certificate program, Organizational Leadership in Social Work. Those who complete the program will gain social work and business acumen needed to start or optimize agencies or other social service-based organizations as well as become transformational leaders. The learning experience features four online courses—video, in-depth readings and other online tools—that encompass organizational management, core social work values, fundraising, financial analysis and viral marketing tactics. Successful completion of all four online courses will result in a professional certificate from both Schools. Enrollment will be limited to current SP2 students and alumni. The self-paced courses also delve into strategic thinking for long-term change, leading human service organizations, using a social work perspective as a management guide, social networks, branding and linking non-financial metrics to financial performance. At the helm of the course are four instructors and faculty members from SP2 and Wharton: Jason Miller, Jonah Berger, Christopher D. Ittner and Richard Lambert. Amy Sadao, Daniel W. Dietrich, II Director at the Institute of Contemporary Art at the University of Pennsylvania, announced the appointment of Bruno Nouril as the ICA’s new director of development. Mr. Nouril comes to Philadelphia from New York where, since 2017, he served as development director at The Drawing Center. During his tenure there, he managed a diverse range of fundraising initiatives, including institutional giving, annual fund and membership, board development and exhibition campaigns. He also oversaw all special events, including the Spring Benefit Gala and Fall Benefit Auction in 2018, both of which far exceeded their fundraising goals. Formerly of the Queens Museum, Art21 and the Museum of Biblical Art, all in New York, Mr. Nouril has devoted much of his career to fundraising for the arts. Mr. Nouril joined the ICA in March. As ICA’s Director of Development, Mr. Nouril will work collaboratively alongside Ms. Sadao and Penn’s central development and alumni relations department to plan, execute and strategize philanthropic goals for the institution. He will also continue to strengthen and build on the momentum of ICA’s “Encounter the Unexpected” campaign within the University’s Power of Penn campaign. Mr. Nouril earned an MA in arts management from Maastricht University, The Netherlands, and holds a BA in religious studies from NYU. The deadline for submission is Monday, May 13, 2019. The McCabe Fund Advisory Committee will select the winners at its annual meeting in June. Penn’s transition to Workday@Penn, the University’s new human resources and payroll system, is fast approaching. As part of the launch, the way you manage your Flexible Spending Accounts (FSA) and your Health Savings Account (HSA) will change. Through June 30, you will continue to manage your FSA using the current ADP enrollment platform, but effective July 1, Penn’s Health Care and Dependent Care FSA accounts administration will be handled on the new, enhanced WageWorks platform. The platform upgrade will make it easier for you to submit receipts, verify expenses and manage your accounts. It will also provide a better mobile experience with access to FSA apps and improved tools. Even though Penn is updating the FSA platform, the rules for using these accounts will remain the same. You may still need to provide receipts to verify that your claims are qualified expenses according to IRS guidelines. Also, effective July 1, Penn’s Health Savings Account administration will move from Aetna/Payflex to WageWorks. Here are additional details about the changes for each type of account and what you can expect before and after the transition to Workday@Penn. If you are enrolled in a Health Care FSA and your silver ADP-branded card expired in March, you may have received a silver WageWorks branded card to use in its place. Activate the card when it arrives. You can use the new WageWorks-branded card for qualified health care expenses through June 30, 2019. You are encouraged to spend down your FSA balances and submit any outstanding claims before June 30. If you do submit claims after June 30 for services performed during the 2018-2019 plan year, you will need to submit those claims on the new WageWorks platform. All claim submissions for the 2018-2019 plan year are due by September 30, 2019. To help facilitate the upgrade to the WageWorks platform, a blackout period will take place from July 1, 2019 through July 12, 2019 so that any remaining balances left in your FSA accounts can be moved to the proper locations. Additionally, as a part of the upgrade, Health Care FSA participants will receive a new orange and blue debit card co-branded with the WageWorks and Penn logos to replace the current card. You can only use the new card for health care expenses incurred after July 1, 2019. After June 30, your current card will be deactivated. Please remember that you can only rollover $500 to the next plan year, so make sure you submit your claims for the current plan year in a timely fashion. Dependent Care plans do not offer a card option and any unclaimed funds will be moved to the new platform. You have until September 15, 2019 to incur plan expenses and may submit claims up until September 30, 2019. After July 1, 2019 claims for the Dependent Care account will need to be submitted using the new platform. If you are enrolled in a High Deductible Health Plan with an HSA, Wage Works will be the administrator of this plan and BNY Mellon will be the custodial bank. A new account will be opened for you at BNY Mellon. In order to establish this new account, HDHP plan participants must agree to the BNY Mellon Terms and Conditions, and can do so during the Open Enrollment period from April 22-May 3 by going on line and completing their enrollment process. Even if you do not wish to make a change to your coverage you must review the terms and conditions. If you have funds in your HSA at the end of the 2018-2019 plan year, WageWorks will transfer the money to BNY Mellon by early August, adding these funds to your new HSA. If you don’t want the funds to be moved, you will receive instructions to opt out of the transfer and you will be responsible for managing any ongoing monthly service fees. HDHP plan participants will also receive a new orange and blue debit card to use in the 2019-2020 plan year. Your current card, which is branded with the PayFlex logo, will be deactivated after June 30, 2019. The University of Pennsylvania’s merit increase program is designed to recognize and reward the valuable contributions of faculty and staff to the University’s commitment to the highest levels of excellence in teaching, research and administration by paying market competitive salaries in a fiscally responsible manner. The merit increase pool for fiscal year 2020 is based on market trends and economic conditions. With this in mind, the following guidelines are recommended. Below are the standards for faculty increases that the Deans are asked to follow. The Deans will give the department chairs their own guidelines at the School level regarding available resources. The minimum academic salary for new assistant professors will be $72,600. Merit increases for faculty should be based solely on performance as evidenced by scholarship, research, teaching and service to the University and the profession. As in previous years, there will be no cost of living increase for continuing faculty. The aggregated merit increase pool for faculty will be 3.0 percent. Some Schools and Centers may have financial constraints that can only support budget growth of less than 3.0 percent. Salary increase recommendations that are below 1.0 percent for non-meritorious performance, as contrasted with general limits applied to an entire class of faculty, must be made in consultation with the Provost. Likewise, salary increases that exceed 5.0 percent due to market conditions must also be made in consultation with the Provost. Deans may wish to give careful consideration to salary adjustments for faculty who have a strong performance record but whose salaries may have lagged behind the market. Presented below are the merit increase guidelines for July 1, 2019. This year’s aggregate salary increase pool is 3.0 percent with a range of zero to 5.0 percent. Merit increases should not exceed 5.0 percent. Any variation less than a 3.0 percent pool must be approved by the Provost and/or the EVP, and will be communicated separately by the School or Center administration. Monthly, weekly and hourly paid staff members are eligible for a merit increase if they are regular full-time, regular part-time or limited service status employees, and are employed by the University on or before February 28, 2019. The following groups are not covered under these guidelines: student workers, interns, residents, occasional and temporary workers, staff on unpaid leave of absence, staff on long-term disability, and staff who are covered by collective bargaining agreements. The merit increase program is designed to recognize and reward performance. The foundation of this program is the Performance and Staff Development Plan. Salary increases should be based on performance contributions within the parameters of the merit increase budget. The Performance Appraisal System documents each employee’s performance and contributions and establishes performance goals for the new fiscal year. All employees must receive Performance and Staff Development Plans for the next review cycle whether or not they receive merit increases. Schools and Centers are requested to submit performance appraisals by June 3, 2019. The Division of Human Resources’ Staff and Labor Relations team is available to discuss performance management issues. Merit increases should average no more than 3.0 percent and may average less if a School or Center establishes a lower percentage merit pool based on financial considerations. The aggregated salary pool within a School or Center may not exceed 3.0 percent regardless of performance rating distributions. Performance expectations should be raised each year as employees grow in experience and job mastery. Performance ratings and raises should reflect a normal distribution for all employees. Employees with unacceptable performance are not eligible for merit increases. The University’s salary ranges have been increased effective April 1, 2019. All staff salaries must be at or above the minimum of their respective grades as of April 1, 2019. There will be no bonuses, in keeping with the elimination of discretionary bonuses announced in prior years. The Division of Human Resources’ Compensation office is available to discuss specific merit increase parameters with Schools and Centers. Staff and Labor Relations team members are available to discuss performance management issues. Penn Nursing’s Linda Aiken, the Claire M. Fagin Leadership Professor in Nursing and director of the Center for Health Outcomes and Policy Research, was awarded an Honorary Fellowship of the Royal College of Surgeons in Ireland (RCSI) Faculty of Nursing and Midwifery. The honor reflects Dr. Aiken’s pioneering research in the field of nursing care and safe staffing. She developed the RN4CAST project, a study examining how organizational features of hospital care impact nurse recruitment, retention and patient outcomes. The project is the largest study of its kind, examining nursing care practices in the United States, Europe, Asia, South Africa, Australia and Chile. The study has produced remarkable evidence of the importance of a smaller patient-to-nurse ratio in improving patient outcomes. She documented that 30-day mortality after common surgical procedures increased by seven percent for each additional patient added to a nurse’s workload. The study also concluded that patients in hospitals with higher proportions of nurses with bachelor’s degrees have better patient outcomes including lower risk adjusted mortality. The conferring took place during a ceremony in late February to open the 38th Annual International Nursing and Midwifery Research and Education Conference, which took place at RCSI. Francesca Russello Ammon, associate professor of city and regional planning who teaches in the graduate program in historic preservation in the Weitzman School of Design, has been selected for an ACLS Fellowship for her project “Preserving the City: Urban Renewal and Restoration in Society Hill, Philadelphia. Preserving the City” applies modern mapping technologies to document the history of Society Hill and the iconic neighborhood’s history of preservation. Given by the American Council of Learned Societies (ACLS), to fund a year of research and writing, the Fellowship is among the most selective in the humanities and social sciences. The American Society of Mechanical Engineers (ASME) Board of Governors unanimously selected Portonovo Ayyaswamy, professor emeritus of mechanical engineering and applied mechanics in Penn’s School of Engineering and Applied Science, as an Honorary ASME Member. The presentation of this award took place at the Honors Assembly in November 2018 during the ASME Mechanical Engineering Congress & Exposition in Pittsburgh, Pennsylvania. Rotonya M. Carr, assistant professor of medicine in the division of gastroenterology in the Perelman School of Medicine, has joined the editorial board of the Journal of Lipid Research as part of the journal’s inaugural cohort of junior associate editors. Four assistant professors, including Dr. Carr, were chosen from nominations by the journal’s associate editors. They will partner with senior editors to learn how to manage the peer-review process, while also contributing a new type of article to the journal—commentaries on promising lipid research published elsewhere. Gregory G. Ginsberg, professor of medicine and director of endoscopic services in the department of gastroenterology in the Perelman School of Medicine, received the Rudolf V. Schindler Award from the American Society for Gastrointestinal Endoscopy (ASGE). The award, ASGE’s highest honor, is granted to a member whose accomplishments in endoscopic research, teaching and/or service to ASGE, exemplify the standards and traditions of the award’s namesake—Rudolf V. Schindler, founder of the American Gastroscopic Club, the forerunner of ASGE. Dr. Ginsberg will accept the honor at ASGE’s Crystal Awards event in May. Nancy Hornberger, professor in the educational linguistics division of Penn GSE, has been recognized with the 2019 Charles A. Ferguson Award for Outstanding Scholarship from the Center for Applied Linguistics on the occasion of its 60th anniversary. The award honors visionaries in applied linguistics for outstanding scholarship, superior leadership skills and the ability to foster collaborations among a wide range of people to enrich the world around them. Xianxin Hua, professor of cancer biology in the Perelman School of Medicine, received an Accelerator Award from the Neuroendocrine Tumor Research Foundation for a four-year study to develop nanobody-directed CAR T cell therapy with combinatory approaches in laboratory animals to kill neuroendrocrine tumor (NET) cells. His work aims to develop efficacious NET-specific immunotherapy. Dr. Hua is among eight recipients whose awards total $2.5 million. The American Academy of Dermatology has honored Carrie L. Kovarik, associate professor of dermatology, and Keith W. Hamilton, assistant professor of infectious diseases at PSOM, as Patient Care Heroes for their collaboration to diagnose a patient suffering from leprosy. During a joint visit, Drs. Kovarik and Hamilton saw the patient who had traveled abroad, and together, they devised an appropriate treatment plan. They continued to collaborate as the patient healed, making adjustments. Doris Wagner, the Robert I. Williams Term Professor of Biology in the School of Arts and Sciences, has been honored as a 2019 Fellows Award recipient from the American Society of Plant Biologists. The ASPB is a scientific professional society devoted to the advancement of plant science and is the publisher of the journals Plant Physiology and The Plant Cell. Founded in 1924, the society works to promote the field of plant biology, in all aspects, and has members around the globe. Each year, ASPB honors a select few plant biologists with the Fellow of ASPB Award given in recognition of “distinguished and long-term contributions to plant biology and service to the Society by current members in areas that include research, education, mentoring, outreach, and professional and public service.” Dr. Wagner is joined by four other distinguished scientists from across the country as one of this year’s recipients. The award will be presented to her during the 2019 Plant Biology Conference in San Jose, California. Her research focuses on transcription, epigenetics, development and stress response in plants using an Arabadopsis model. Penn’s Hecht/Hamlin Tennis Center was recently recognized by the United States Tennis Association Middle States section as the 2018 Commercial Organization of the Year for the Philadelphia District. 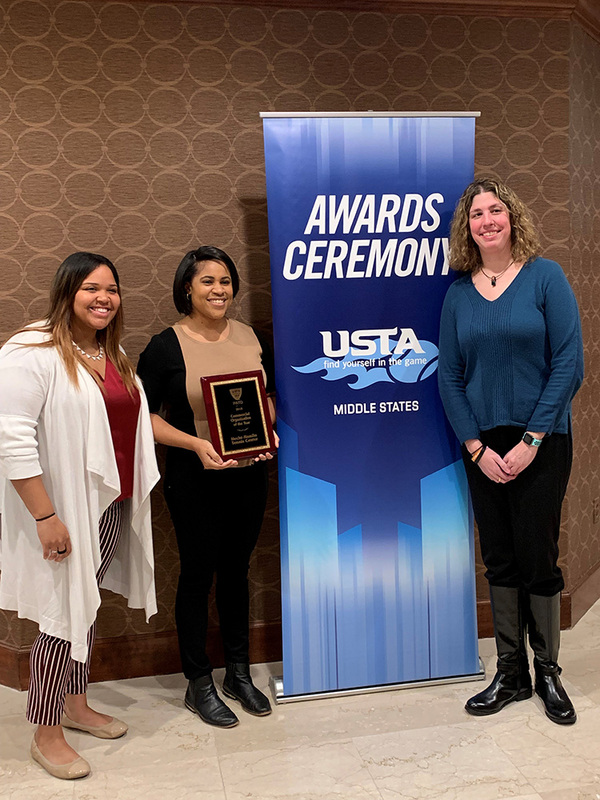 The Philadelphia District is the largest tennis district within the Middle States section and Penn’s facility was nominated and chosen as an award recipient by the USTA staff and volunteer organizers. This is the first time that the Center has won this award. Five Penn Dental Medicine students will be serving in national leadership roles in the American Student Dental Association (ASDA) for the 2019-2020 academic year, including the group’s top post. This is the second year in a row for a Penn Dental Medicine student to be chosen to lead this national organization—the first time since 1979-1980 that there have been back-to-back ASDA presidents from the same school. Second-year student Craig McKenzie (D’21) succeeds Roopali Kulkarni (D’19) as president, who will also continue to serve on the ASDA Board of Trustees. In addition, Leslie Tay (D’20) was appointed to Council on Communications Chair; Nasim Levin (D’20) was appointed Advanced Standing/International Dental Student Advisory Committee Member; and Julia Cheung (D’21) was elected District 3 Trustee. The nation’s largest dental student organization, ASDA aims to protect and advance the rights, interests, and welfare of dental students and represents 24,000 members nationwide. Richard Ling (E’20, C’20) proposes to advance university-assisted environmental and environmental health education in West Philadelphia schools, which builds upon the work of his nonprofit and Penn club, Sustainable Solutions (SS). Harrison Feinman (C’22), Eva Gonzalez (C’22), Hadeel Saab (C’20) and Anna Waldzinska (C’20), propose to build upon the success of the fall 2018 Penn Leads the Vote (PLTV) re-launch and Emily Falk’s fall 2018 COMM 310 Academically Based Community Service (ABCS) class that worked with PLTV and will focus on increasing voter engagement at Penn and in the community. Perry World House, the University of Pennsylvania’s center for global policy engagement, has announced its 2019-2020 postdoctoral fellows. Perry World House selected the new fellows based on a demonstrated track record of academic excellence and the policy relevance of their research. Each of the fellows will spend a year on campus, researching, writing and connecting with the community. The Perry World House postdoctoral fellows program not only brings new ideas to Penn but also reflects a commitment to expanding the pipeline of new scholars working on critical global issues. In addition to pursuing their own academic research, the fellows support the institution’s mission, including by serving as advisers for undergraduate fellows pursuing yearlong policy projects and helping to shape Perry World House colloquia and workshops. Erik Lin-Greenberg is a PhD candidate in political science at Columbia University and a Carnegie Predoctoral Fellow at Stanford University’s Center for International Security and Cooperation. He is currently examining how drones and other remote warfighting technologies affect crisis escalation, work that will continue at Perry World House. His research has appeared in a variety of academic and policy outlets including Security Studies, Journal of Peace Research, International Peacekeeping, The Washington Post, War on the Rocks, and The South China Morning Post. Mr. Lin-Greenberg previously served as an officer in the United States Air Force, where he led a 125-member intelligence team that supported conventional and special operations forces. Lama Mourad is a PhD candidate in political science at the University of Toronto and pre-doctoral fellow at the Harvard Kennedy School of Government’s Belfer Center for Science and International Affairs. She specializes in comparative politics and the politics of migration, with a regional focus on the Middle East. At Perry World House, Ms. Mourad will work on developing her dissertation into a book manuscript, provisionally titled Open Borders, Local Closures: The Local Politics of Refugee Crisis. She will also advance two ongoing projects at the intersection of decentralization, local governance and migration policy in the global South. Lauren Pinson is a PhD candidate in political science at Yale University. She studies the governance of cross-border illicit trafficking, particularly of drugs and small arms. At Perry World House, Ms. Pinson will work with Beth Simmons, the Andrea Mitchell University Professor in Law, Political Science and Business Ethics, on the Borders and Boundaries in World Politics project, which examines how political life both affects and is affected by international borders and border security policies. Prior to her graduate studies, Ms. Pinson spent three years as a senior researcher at the National Consortium for the Study of Terrorism and Responses to Terrorism (START). Marianne F. Potvin is a PhD candidate in urban planning and architecture at Harvard University. She studies the nexus between humanitarian action and the politics of urban planning and technology. During her time at Perry World House, Ms. Potvin will complete a series of articles on the transformation of the humanitarian project in relation to rapid urbanization and the impacts of technology. During her career, Ms. Potvin has contributed to international policy forums such as the United Nations High Commissioner for Refugees (UNHCR) Annual Protection Dialogue, the UN-Habitat Informal Urbanism Hub and the Design for Humanity Initiative. Robert Shaffer has a PhD in government and MS in statistics and data science from the University of Texas at Austin. He is a current postdoctoral fellow at the University of Pennsylvania’s Perry World House and will be returning for this coming cohort. At Perry World House, Dr. Shaffer is working on the Borders and Boundaries project and studying variation in sentiment and framing of international borders across time and space, both in formal legal documents and in media sources. Dr. Shaffer’s work has appeared in Political Analysis, Cognitive Systems Research and the Journal of Web Semantics. Outside the academy, he is affiliated with the Constitute project and helped to develop an interactive exhibit on the content of national constitutions at Philadelphia’s National Constitution Center. Jonah Stuart Brundage is a PhD candidate in sociology at the University of California, Berkeley. He uses the tools of historical sociology to study processes of global governance and international cooperation and conflict. At Perry World House, Mr. Brundage will develop his comparative analysis of the diplomatic services of eighteenth-century Britain and France into a book. He will also be working on a new research project that turns to the bases of global governance in the present day, with a focus on monetary policy and central banking. Mr. Brundage’s work has appeared in the American Sociological Review and Comparative Studies in Society and History. The first Penn Relays was held on April 21, 1895, but the origin goes back to 1893. When the University Track Committee, chaired by Frank B. Ellis, Class of 1893, looked for ways of adding interest to their spring handicap meet that year, they struck on the idea of a relay: four men each running a quarter mile in succession. The idea created enough interest that a team from Princeton was invited to contest the event. Penn lost to Princeton by eight yards. The following year Penn exacted its revenge. Interest in the first two years’ races was such that the committee decided to sponsor a relay meet in 1895 with hopes of reviving sagging interest in Penn track. The first Penn Relays also served as the dedication for Franklin Field. Held on April 21, 1895, it was a smash success. The meet drew an attendance of approximately 5,000, the largest track and field crowd to date in Philadelphia and one of the largest ever in America. The first team to win a Penn Relays championship was Harvard University men’s team, defeating Penn in the 4x440 relay. Relays at varying distances were added in the years following, as well as non-relay track and field events, from sprints and hurdles to several field events. The festive atmosphere provided by the tent camp was responsible for the term “Carnival,” which was officially adopted as part of the meet’s name in 1910. Today, the carnival atmosphere still exists, both inside Franklin Field and the surrounding Carnival Village, and outside on the nearby streets. Expansion marked the first two decades of the Carnival, and in 1911, 10 years before the first NCAA championship meet, each college and high school championship event became known as the “Championship of America.” Until the NCAA conducted its first national championship track and field meet in 1921, the Penn Relays was generally recognized as the only meet that brought together contestants from every part of the country. In 1914, the Relays became an international event when Oxford University crossed the Atlantic to compete. The annual event has become the longest-running track and field event in the history of the sport. 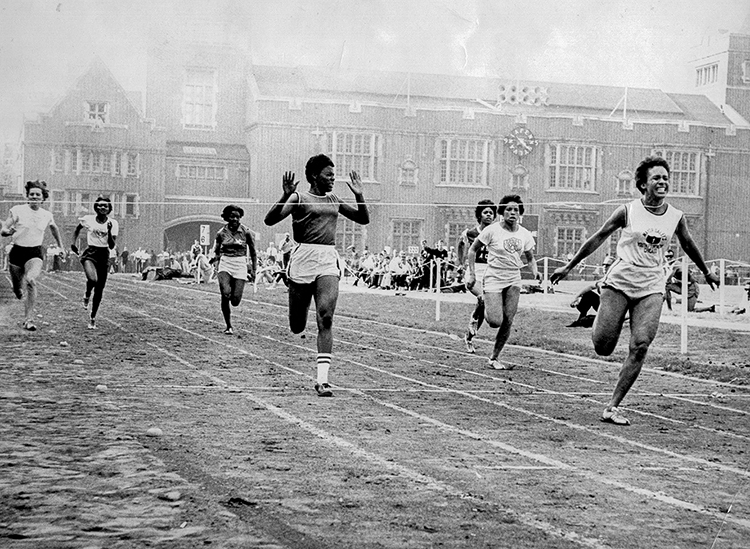 The Relays was the first successful invitational track meet that welcomed all races and all schools from the outset and without interruption, and it was the first invitational track meet with separate divisions for colleges, preps and high schools to show any degree of success and continuity. Within five years of its start, the Relays had added junior high school events as well as individual events, which included several of the great post-collegiate stars of the sport. 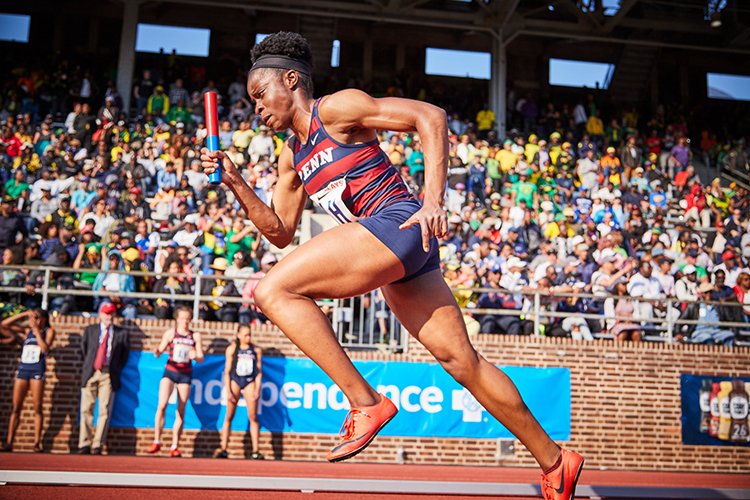 In the modern era of the Relays, each year over 15,000 male and female athletes compete in high school, college, Olympic development and professional races. Across the three days of competition, over 110,000 fans travel to Franklin Field to watch the action. 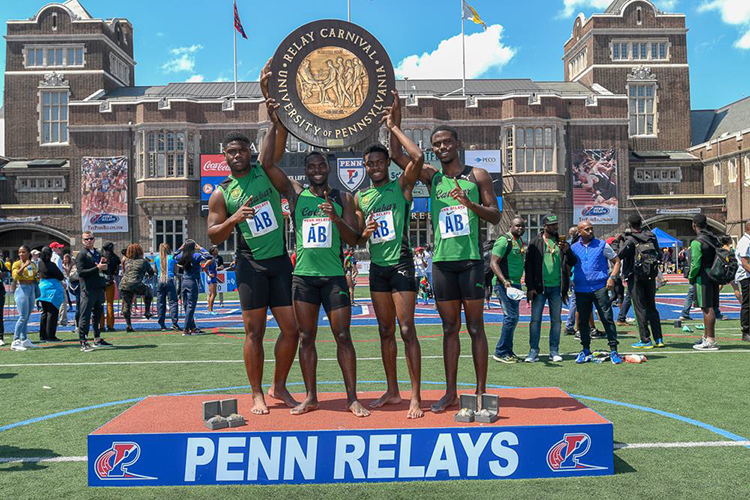 The Penn Relays have become a marquee event in Caribbean culture, which was further intensified in 2000 with the first USA vs. the World race. This race has become a fan favorite on Day 3 of competition, allowing spectators to see some of the best runners in the world compete. Ticket Information: This year’s Relays will be held April 25-27. For faculty and staff: On Thursday, get one free ticket with valid PennCard, or two if participating in Bring your Child to Work Day. On Friday and Saturday, get 50% off race day prices with a valid PennCard. Offers only redeemable in person at the Franklin Field Ticket Office. Tickets for Penn students are free Thursday and Friday with a PennCard, $6 in advance on Saturday and $10 at the gate. Student tickets can be purchased in advance through the Penn Student Ticket Portal. 15 Comparative Philology and the Origins of Russian Formalism; Jessica Merril, Columbia University; 6 p.m.; rm. 209, College Hall (History). The April AT PENN calendar is now online. The deadline for the May AT PENN is April 15. On a reporting trip to Ukraine in 2008, Nadine Epstein became fascinated by her shadow on the land on which her ancestors had trodden, inspiring nearly a decade of insightful, fluid digital images that make up her iShadow Project. Since then she has made impermanence fixed, taking thousands of photographs of shadows during her travels around the world as a magazine publisher, editor and writer. The photographs, largely self-portraits, are steeped in culture, history and environment, often with spiritual overtones. In them, variables such as surface texture (natural and manmade), the time of day, the wind and moisture in the air as well as attire; hair and hormones combine with the unending line and movement of the human shape, not to mention the filters of light, soul and experience. On April 17 at 5 p.m., Ms. Epstein will give a talk in the Gallery on her photos and on her most recent book, Elie Wiesel: An Extraordinary Life and Legacy, published September 2018. A reception will follow the talk. Ms. Epstein is editor-in-chief and CEO of Moment Magazine, and founder of the Daniel Pearl Investigative Journalism Initiative. She is a 1978 Penn graduate with both a BA and an MA in international relations and was a University Fellow in the political science doctoral program at Columbia University. 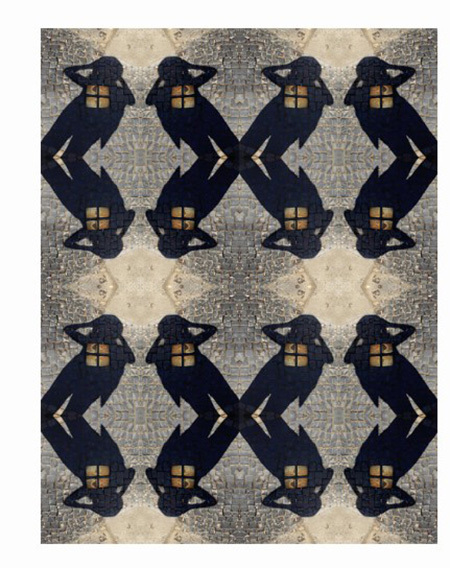 A lifelong multimedia artist and keeper of drawing journals, her recent iShadow Project photography, as seen in a 2017 Penn Gazette article, has been featured in solo exhibitions and group shows. The Burrison Gallery is located in the University Club at Penn on the 2nd floor of The Inn at Penn, 3611 Walnut Street, and is open Monday through Friday from 7:30 a.m. to 5 p.m. This spring, the Morris Arboretum will once again host its annual Japanese Cherry Blossom Days, in partnership with the Subaru Cherry Blossom Festival of Greater Philadelphia. The Subaru Cherry Blossom Festival is an initiative of the Japan America Society of Greater Philadelphia with the goal of fostering a better understanding of the cultural, social and educational customs of Japan in the United States. In the early 20th century, John and his sister, Lydia Morris (founders of the Morris Arboretum) established one of the finest collections of Japanese plants and gardens in the region at their home, Compton, which would later become the Morris Arboretum. 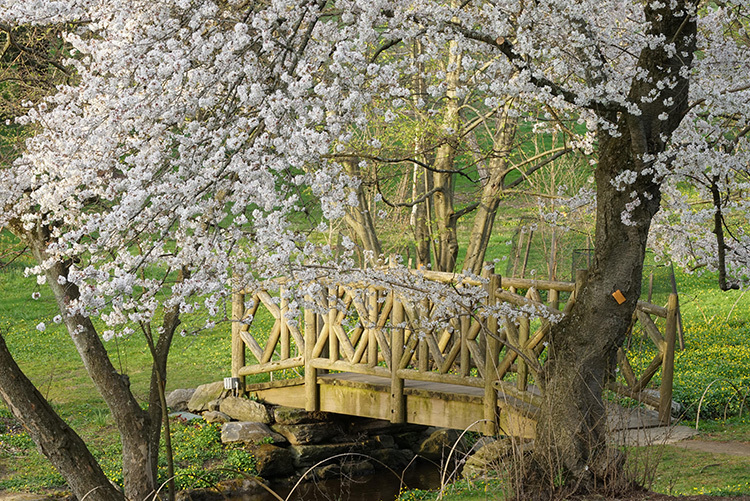 To commemorate this heritage, Morris Arboretum celebrates Japanese Cherry Blossom Days on Saturday, April 13 and Saturday, April 20, 10 a.m.-3 p.m., with a variety of activities, all included with garden admission. The events are for children and adults, and will celebrate the art, culture and gardens inspired by the more than 35 varieties of cherry trees that grace the Arboretum with their blossoms each spring. Cherries should be in flower this year during these events. Although hard to define, the full bloom is usually based on when 70 percent of the Yoshino cherry (Prunus × yedoensis) blossoms are open. Two groups in Washington, DC, study the weather extensively to predict the blooming period: The National Park Service, (www.nps.gov) and the National Cherry Blossom Festival (www.nationalcherryblossomfestival.org). Philadelphia Yoshino cherries flower about one week to 10 days after those in Washington, DC; expect bloom time to be somewhere around April 10-16. Also, the Morris Arboretum has more than just Yoshino cherries, so there is always more to see. For a detailed list of activities, visit Morris Arboretum online at www.morrisarboretum.org or call (215) 247-5777. The Anne d’Harnoncourt Symposium 2019 Impressionism Around the World: Art and Globalization—sponsored by Penn’s department of the history of art and the Philadelphia Museum of Art—will take place April 12-14 at the PMA’s Perelman Auditorium. How did a quintessentially French art movement become an international phenomenon? Leading scholars explore Impressionism’s global reach at the turn of the 20th century. 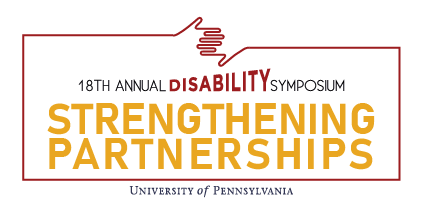 The Weingarten Learning Resources Center at University of Pennsylvania presents the 18th Annual Disability Symposium on Friday, April 12 in Houston Hall. The theme, Strengthening Partnerships, highlights the critical value of collaboration and communication while offering strategies to reinforce those connections. Participants will explore this topic with students, University partners and colleagues, service providers and families. Salome Heyward is a civil rights attorney and author with over 40 years’ experience in the field of disability discrimination law and disability management. Anthony L. Rostain is a nationally recognized expert in the field of child and adolescent psychiatry and professor of psychiatry and pediatrics at the Perelman School of Medicine. 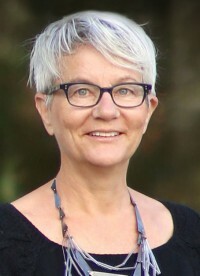 B. Janet Hibbs is a recognized authority on parent-child and family relationships with faculty positions for more than 15 years in graduate programs for psychologists and marital and family therapists. The Disability Symposium is made possible by a gift from Mary Perednia Landy, (C’83) and Joseph P. Landy (W’83). Below are the Crimes Against Persons, Crimes Against Society and Crimes Against Property from the campus report for March 25-31, 2019. View prior weeks' reports. —Ed. This summary is prepared by the Division of Public Safety and includes all criminal incidents reported and made known to the University Police Department for the dates of March 25-31, 2019. The University Police actively patrol from Market St to Baltimore and from the Schuylkill River to 43rd St in conjunction with the Philadelphia Police. In this effort to provide you with a thorough and accurate report on public safety concerns, we hope that your increased awareness will lessen the opportunity for crime. For any concerns or suggestions regarding this report, please call the Division of Public Safety at (215) 898-4482. Below are the Crimes Against Persons from the 18th District: 5 incidents (1 aggravated assault, 1 domestic assault and 3 assaults) with 1 arrest were reported from March 25-31, 2019 by the 18th District covering the Schuylkill River to 49th Street & Market Street to Woodland Avenue. The voter registration deadline for the Pennsylvania Primary is Monday, April 22, 2019. The Pennsylvania Primary is Tuesday, May 21, 2019. The University of Pennsylvania’s Office of Government and Community Affairs promotes voter registration, education and participation across the campus community. 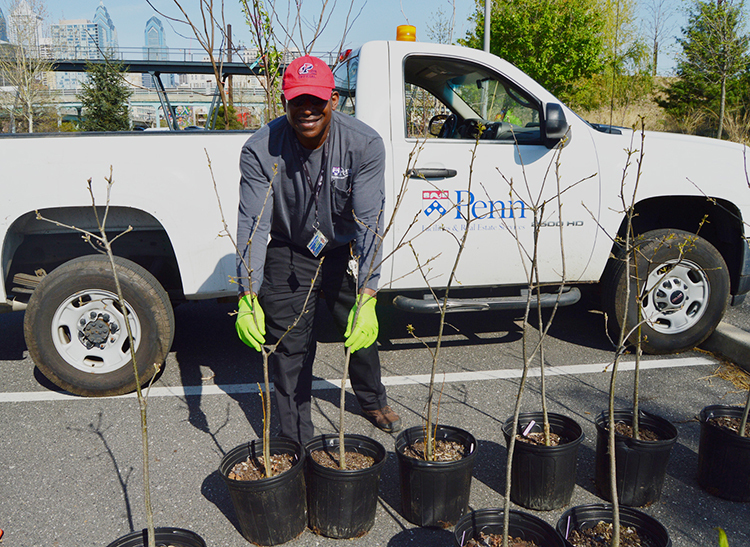 Penn’s Facilities & Real Estate Services will again this year sponsor Creating Canopy, the tree giveaway program open to Penn and UPHS staff and faculty. This environmental sustainability program is designed to help build the tree canopy in the region and increase awareness of the impact of individual actions on the environment. Information on the trees available for spring 2019 will be posted online by the time registration opens. Read the descriptions to help you decide which tree is best for your yard, neighborhood and skill level. You will also find information about planting and caring for your tree on the Sustainability website. Email sustainability@upenn.edu with questions. Special accommodations for tree pickup will be made for Penn employees at the New Bolton Center who pre-register for a tree.